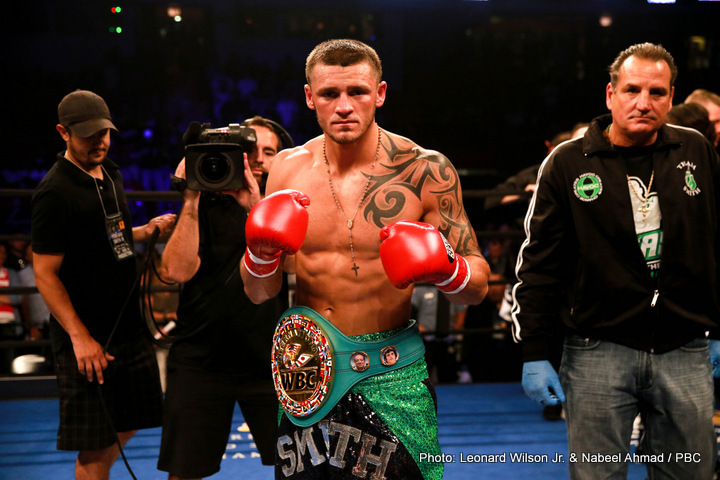 Light-heavyweight contender Joe Smith Junior, the man most well known for ending the career of the great Bernard Hopkins, last night returned to the ring for the first time in almost a full year. Fighting in Uncasville, the 28 year old despatched Melvin Russell, 11-4-2, inside the opening round. Smith, who improved to 24-2(20) scored two knockdowns in winning at the 1:45 mark. Having been soundly outpointed by Sullivan Barrera in his last fight back in July of last year, a fight that saw Smith suffer a serious injury to his jaw, the comeback win no doubt restored a good deal of Smith’s confidence – so much so that he is now calling for a shot at reigning WBO 175 pound king Sergey Kovalev. Kovalev, beaten only by the sublime (and now retired) Andre Ward, will defend his belt against Eleider Alvarez in August, but after that he may or may not accommodate Smith. But if the fight does actually happen (and it seems more likely Kovalev will target bigger fights, with rival champions, seeing as how the Russian banger has said he aims to prove he is the top dog of the division once more) it’s fair to say Smith would enter the ring as a big underdog. Still, Smith is a good fighter, a tough man, and he has a great story and plenty of fans want to see him do well. Smith has upset the odds before of course, but a win over Kovalev really would be something.